Olivia, Lynn and Kevin Shelfer are generational growers and the owners of Joshua Citrus in DeSoto County. Caleb Shelfer, Olivia’s brother, is grove manager. 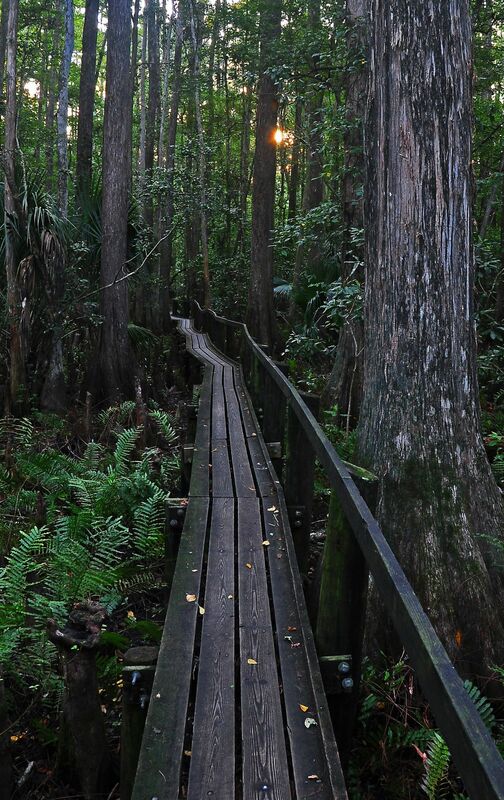 Cypress Swamp Trail is noteworthy for a historic catwalk. Hope is on the way for citrus farmers losing crops and cash because of citrus greening. Greening disease infects citrus plants with a bacteria that slows the flow of nutrients and destroys the tree’s ability to mature. That’s where this new nanotechnology comes in. It’s called Aqua-Yield. It’s a Utah-based company that originally created liquid fertilizer for sod. But starting in 2015, it licenses TriYield to distribute it to citrus growers in Florida. It’s there that it has seen some success. “This is really the first year we have seen massive results. And we have seen massive results. We are harvesting double this season than what we did last year,” said Justin Sorrells, an Arcadia citrus grower. The fertilizer is often packed with nutrients, custom tailored to the crop they are being applied to. For citrus, the active nutrient is zinc, which is delivered in a small enough form that it can pass through the strangled phloem of a citrus plant afflicted by greening. “Zinc has nutritional value for the tree, and when the concentrations get high enough, they can actually have a bactericidal effect,” said Chris Kamberg from TriYield. The liquid fertilizer is not a cure for the disease. Florida citrus farmers started using it three years ago during a pilot program period. Since then, despite hurricanes and colder temperatures, some farmers said they are seeing noticeable progress. In Southwest Florida the citrus industry produces about 30 percent of the state total, according to Gulf Coast Grower’s Association. Right now farmers are hard at work harvesting their crop for the season. Last year Hurricane Irma made a big impact on production, but this year it’s looking up. “It means a lot to me to be a family business, I think it makes it unique because it’s been passed down through generations on this same property,” said Lynn Shelfer, Joshua Citrus Inc.
For six generations the Shelfer family has owned Joshua Citrus. “I’ve lived here all my life, I didn’t plan on being in the citrus business when I was young, I told everyone I went to college because I didn’t want to drive a tractor but here I am,” said Kevin Shelfer, Joshua Citrus. Joshua Citrus Inc. has been named a century pioneer farm. In 1887, James Shelfer moved from Texas to Florida after the Civil War to start a citrus farm along Joshua Creek. And it’s been in the family ever since. “Ugh, sorry, I always start crying when I tell this part, for me to marry into this family and then my children to work here I mean it just means the world to me,” said Lynn. “We had them here with us everyday, it just makes for a more close family unit when you can spend that much time with your kids,” said Kevin. Now their kids, Olivia and Caleb both work on the farm. Caleb, “Farming means everything to me, I’ve been doing this my whole life pretty much, and it’s a lot of handwork, there’s no limit to the hours you have to put in per day anything happens you have to be there,” said Caleb Shelfer. Caleb is the grove manager and Olivia runs communications. “It really brings pride to my family and I, to show what we’ve worked so hard for for all these years and for people to see and understand a little bit more about agriculture in general, or even citrus industry from us,” said Olivia. They grow 10 different types of citrus on about 300 acres of land. From October to May is picking season, the rest of the year is spent doing maintenance. “You’ve got to take this blossom right here, to this piece of fruit right there, that takes lots of time, lots of work, people don’t realize how much work it takes to get that orange to that size right there,” said Caleb. And being a family business has it’s challenges. “It’s trying at times, but we definitely get along, and plan to get along and keep everything going,” said Olivia. Washing, waxing, packaging, fresh squeezing juice, all takes place on location. “We feel like we are different from a lot of the industry, you can actually buy our citrus here,” said Lynn. Their love for the business runs deep. “It feels good to be able to grow your own fruit, be on your own land and work in this area, it’s really nice,” said Caleb. “I hope it stays in the family for a long, long time, ” said Kevin. Digitization of ag: what the doctor ordered? The point is that if machine learning can be used to riffle through millions of photos of actual colonoscopies as Dr. Bengio described in his presentation, link them to ultimate diagnoses of each, and quickly predict that your own colonoscopy gives you (say) a 95 percent chance of developing a stage 2 tumor — then certainly the same technology is theoretically capable of scanning a photo of a farmer’s field and deducing that she/he has (say) a 95 percent chance of a Phytophthoraoutbreak so that a preventive application of fungicide can be scheduled. Very likely. In fact, it may be in our midst already. Will it ultimately be to the benefit of everyone working in agriculture? Highlands Hammock State Park’s Monday Morning Nature Walks for the month of February started Feb. 4 at the Cypress Swamp Trail, noteworthy for a historic catwalk. Alligators, turtles, otters and snakes are sometimes spotted. February walks include Ancient Hammock Trail (Feb. 11), Wild Orange Trail (Feb. 18) and Young Hammock Trail (Feb. 25). Hikes begin at 9 a.m. and take approximately one hour to 90 minutes. Highlands Hammock, 5931 Hammock Road, Sebring. Park entry fees of $6 per vehicle (up to 8 people), $4 per vehicle for a single person, and $2 for bicyclists and those on foot.